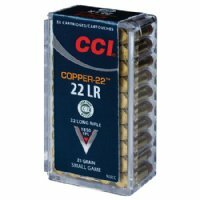 CCI Lead Free .22 Long Rifle 21 Grain Copper 50 Rounds .22 LR Copper - Lead Free Clean-burning propellants keeps actions cleaner. Sure-fire CCI priming. 21 grain copper bullet; lead free. Packaged in boxes of fifty with one hundred boxes per case.